It’s that time of year again…when fall turns into the holiday season. 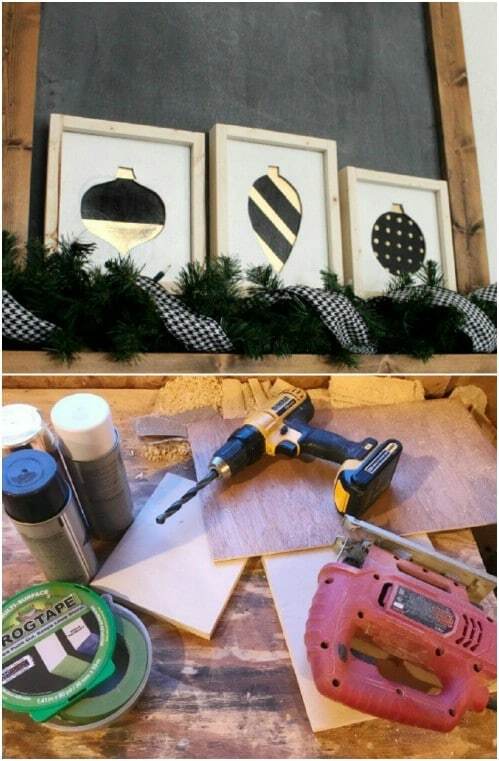 Now is the time to start all of those DIY projects that you want to get finished in time for your Christmas decorating. You know, those projects that you swear every year you’re going to do and then you just run out of time. Well, if you have thoughts about making some DIY wooden signs to decorate this holiday season, I have just the project list for you. 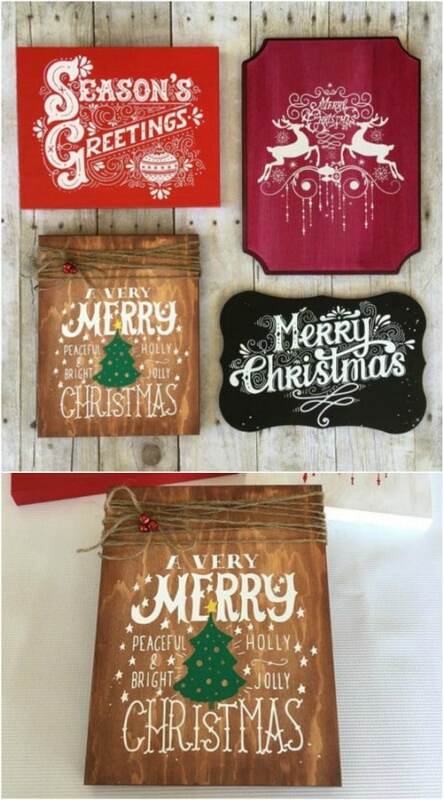 I have a list of 20 unique DIY wooden signs that will help you to make the most of your Christmas decorating. These wooden signs are all so very easy to make and many of them can be done with reclaimed wood. You know me. I am a huge fan of reclaimed wood projects and anything that has a rustic farmhouse appeal, especially in my Christmas decorating. Be sure that you check out my 13 DIY clay Christmas tree ornaments if you really like to make your own decorations. 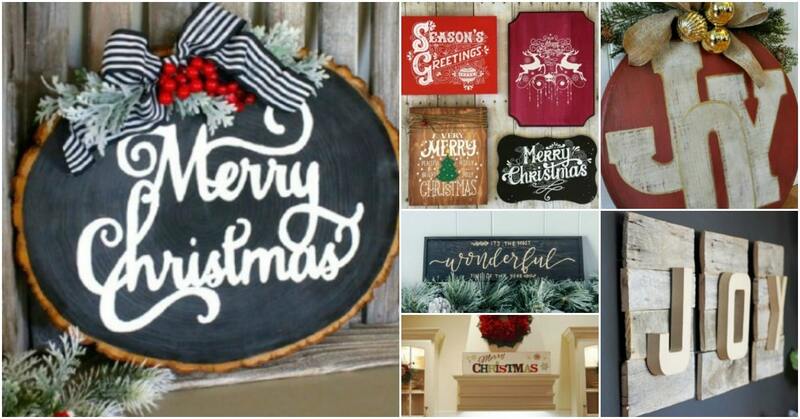 So, if you really want some rustic DIY Christmas décor, then these signs are for you. 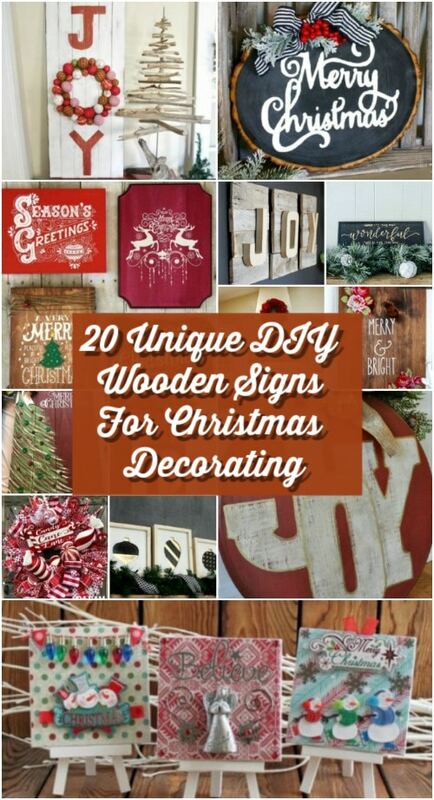 There are light up signs, reindeer signs and so many other wonderful ideas in here. You are going to love these and you’ll love how easy they are to make. And they make wonderful gifts for the holidays, too. If you truly love DIY Christmas decorations, these are definitely something you want to see. And, be sure to also check out my 30 easy crochet Christmas tree ornaments, too. I found this gorgeous wooden sign on Etsy for less than $8, but I though that you could easily recreate the look yourself if you wanted to. It’s just a wooden board and you cover the front with fabric or scrapbooking paper and then add some embellishments. Grab some ornaments at the Dollar Tree and hot glue them to the sign. Or, you could always pick this one up on Etsy. It has a gorgeous silver angel and snowflakes. These wooden signs look like you bought them in a store but this easy DIY screen printing technique is a great way to make them yourself. You use stencils to create the design that you want. You can buy a starter kit for screen printing but honestly, you could just as easily make the supplies yourself and save some money. And, you can choose whatever design that you want for your wooden sign – just make the stencil to go with it. 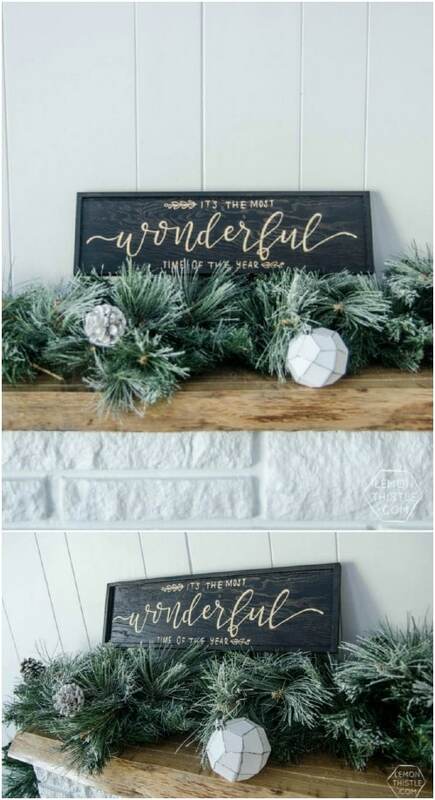 This wooden Noel sign is perfect for sprucing up the porch this holiday season and it’s really easy to make. You just need a strip of wood – the inside of an old dresser drawer front would be perfect for this – and then the lettering and a small evergreen wreath to create the “O”. 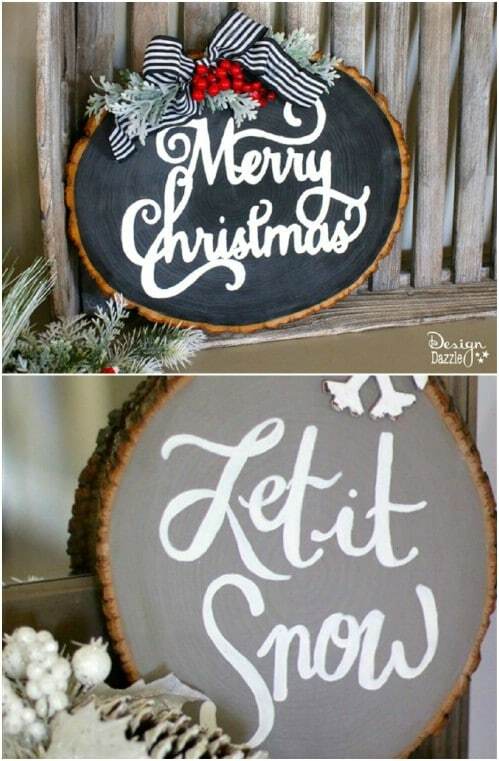 You could paint the letters on if you don’t want to spend money buying wooden ones and even make your wreath out of fresh evergreen so this could be a completely free project to create. I love using fresh evergreen in Christmas decorating. I absolutely love this DIY wooden sign. It is so simple to make and you can do it with reclaimed wood. Have an old pallet lying around? Use that to make this one. I love how the “O” in Joy is made from ornaments that are assembled into a little wreath. 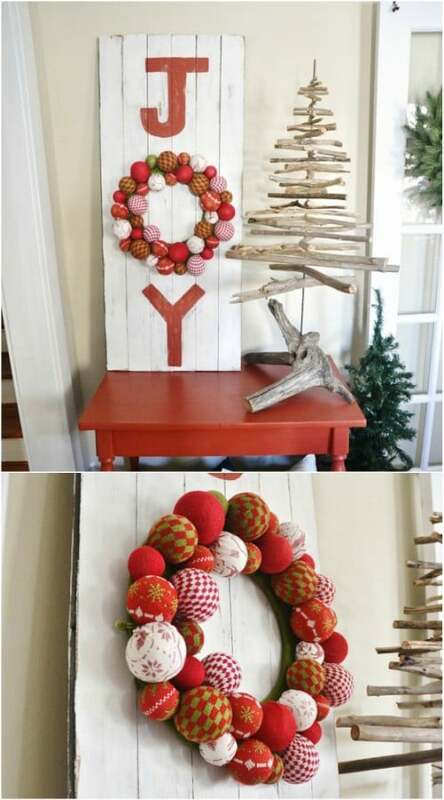 You can paint the “J” and the “Y” onto the wood or you could pick up some wooden letters from the Dollar Store and use them and then just fill in the “O” with your ornament wreath. 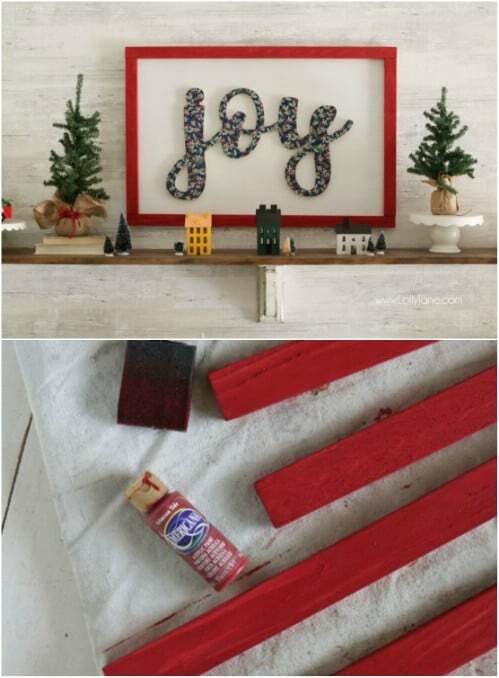 This Joy sign is also really festive and pretty easy to make. The Joy in this one is written in cursive and it’s cut out from wood. Then, you just cover the wood with a festive looking fabric and frame it. There are a few more steps in there, but you get the idea. This is really simple to make and it would look great hanging on the wall, on the porch, or as part of your fireplace display. I love any project that repurposes something into something else. This light up wooden Christmas tree is one of those. You make this from an old pallet – or if you just have pieces of reclaimed wood lying around, you could use that, as well. This one is great for the front porch. It lights up when it’s finished! And, it has that great rustic look that is so popular in Christmas decorating. If you love the song then you are going to adore this little sign that you can make in about an hour or so. You can use reclaimed wood for this one, too. Aside from the wood, you just need some wood stain, an engraving tool and a few other crafting supplies. This one would look beautiful above the fireplace or hanging on the wall. Here is an adorable little sign that I found on Etsy for less than $20. You could easily do this one yourself. You just need a piece of reclaimed wood, some white and red paints and the candy cane for the corner. I’ll bet you could have this one made yourself in about an hour or so if you don’t want to buy it already done. Either way, it’s an adorable way to dress up the front porch this holiday season. 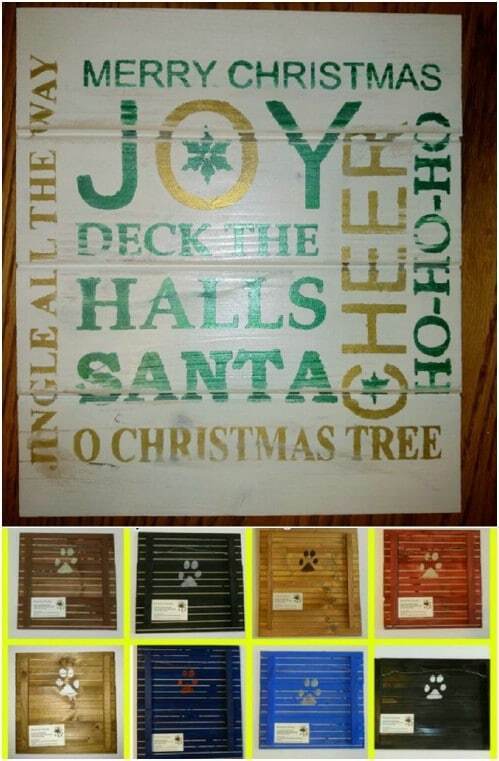 If you have an old pallet that you want to use for a holiday DIY project, this is a great project to check out. 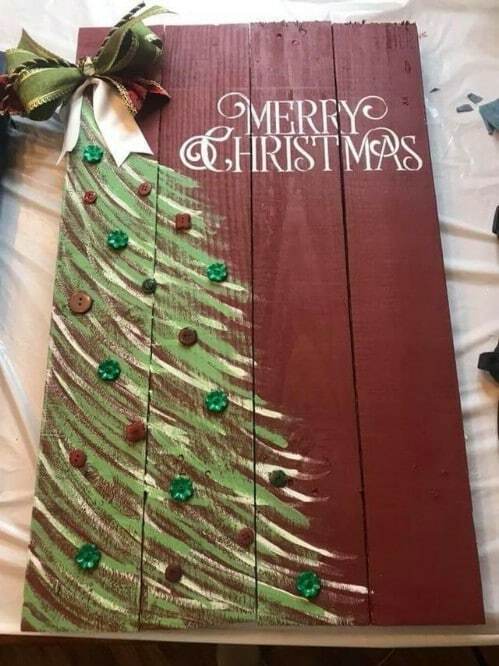 You just turn that old pallet into a gorgeous Christmas tree painting. All you need for this one is just a little paint and if you want, you could drill holes and add actual lights so that it lights up, too. This is a pretty simple one to make and it would look great on the porch or hanging on the side of your house. This hand painted sign is super simple to make and you could customize it however you wanted. I do love the flowers in the corner, and those are actually fabric flowers. You just sort of decoupage them into your design. You can also use paper flowers or even hand paint in some poinsettias or other holiday designs. This one is great for above the fireplace mantel and it makes a wonderful gift, if you tend to give DIY Christmas gifts. You know Dasher and Dancer and Prancer and Vixen…Don’t you just love the old time version of Rudolph? 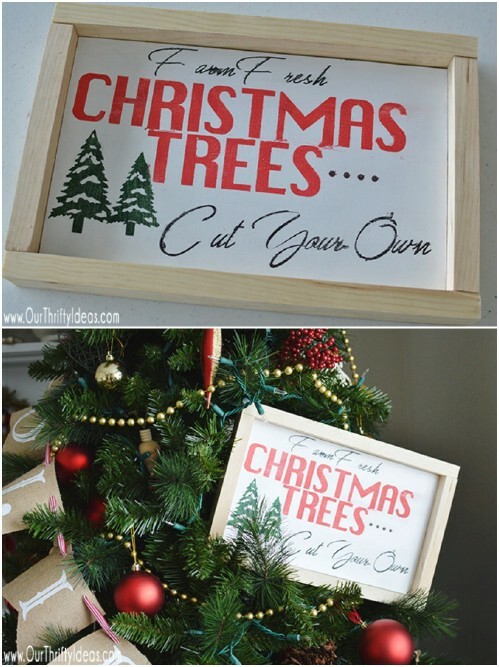 If you do then this DIY wooden sign is perfect for your holiday decorating. You just take an old piece of wood and use it to name off all of the reindeer. It’s a lovely sign and you could customize it by using different holiday colors or even turning the lettering into a subway art type of piece. These signs are great for your indoor decorating and they are really easy to make. 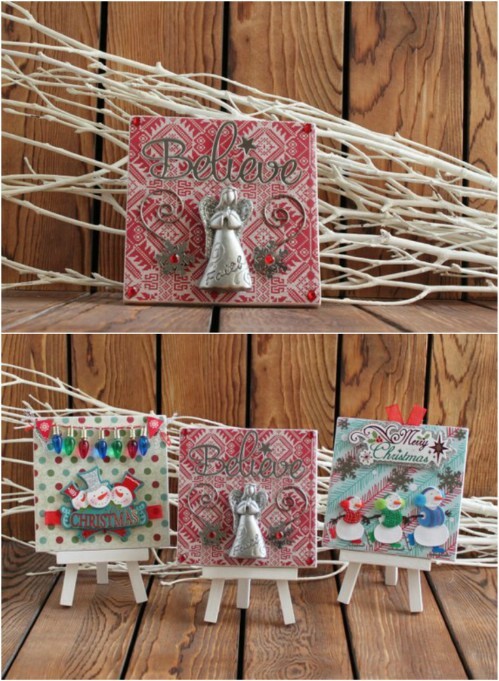 You can even choose the style of your favorite ornaments to create them. These would also make wonderful DIY Christmas gifts or you could hang them above the mantel or just anywhere that you need some additional holiday décor. And you can do them in traditional black and white or add some festive coloring. I found this great little sign on Etsy, but it looks easy enough to recreate. I love the little jingle bells on the side. 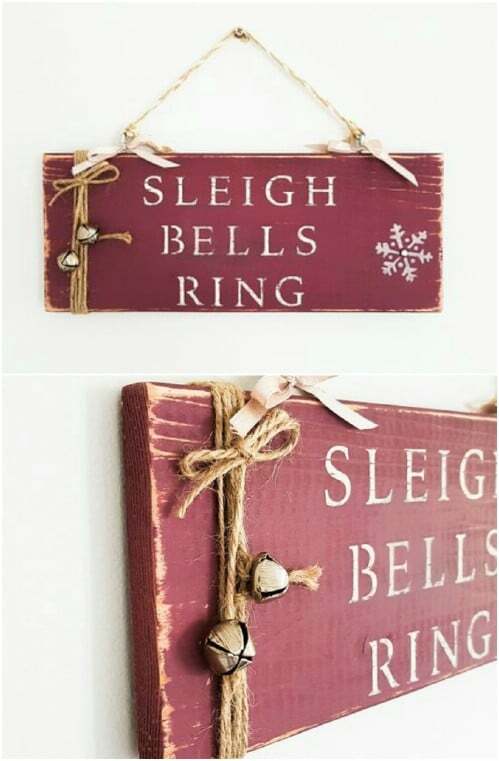 You could make this one with a scrap piece of wood, some cheap bells from the Dollar Store and some festive Christmas ribbon, plus a little paint. Just add some wire or twine for hanging and you’re all set, or just grab this one on Etsy for less than $20. This DIY wood slice sign is really easy to make and if you happen to have some wood outside that you can cut into slices, this one is really cheap. Otherwise, you can find these wood slices at most craft and hobby stores. Once you have the wood – and you can do this in any number of sizes – you just add the decorations with some paint, ribbon and other embellishments. Use chalkboard paint and you can change your message whenever you want. 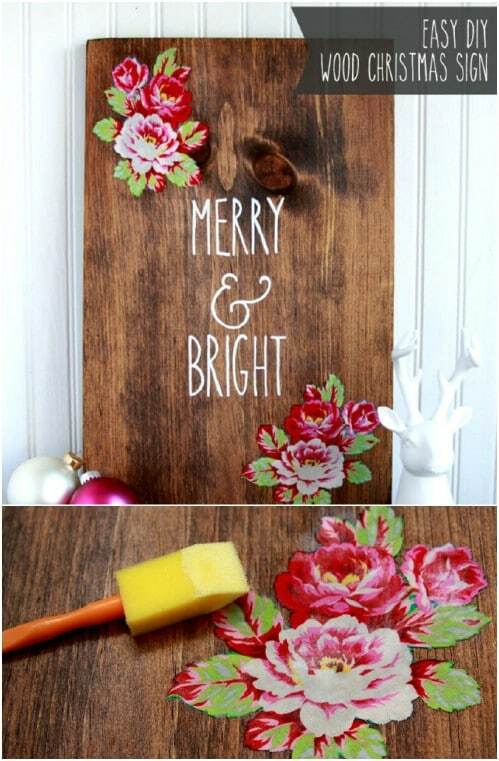 You don’t have to be a whiz at painting to make your own wooden Christmas sign. In fact, this one is made with stickers. 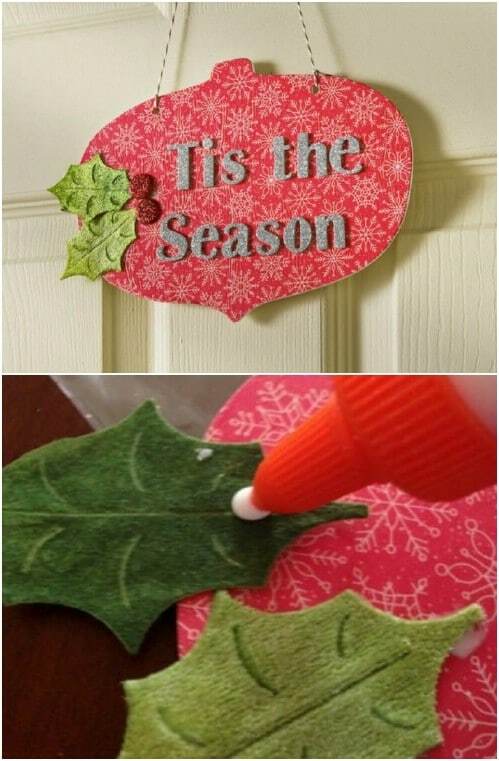 You can find holiday stickers at any craft or hobby store and then you just use those stickers to create the sign that you want. No painting and no fussing. 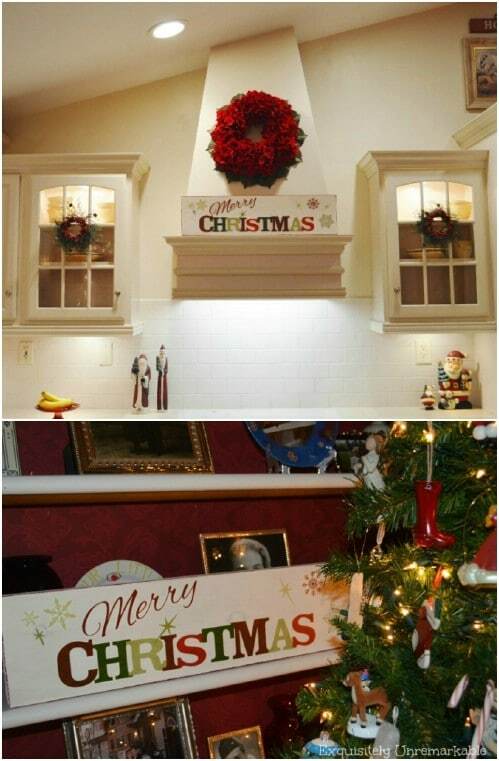 You can do one of these in less than an hour, so you have time to do several and have the hanging all over the house! 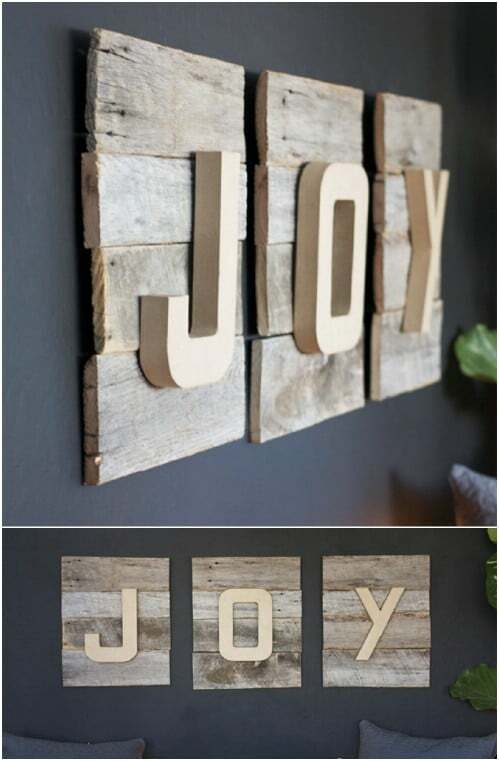 Here is another wonderful Joy sign and this one can be made from reclaimed wood. 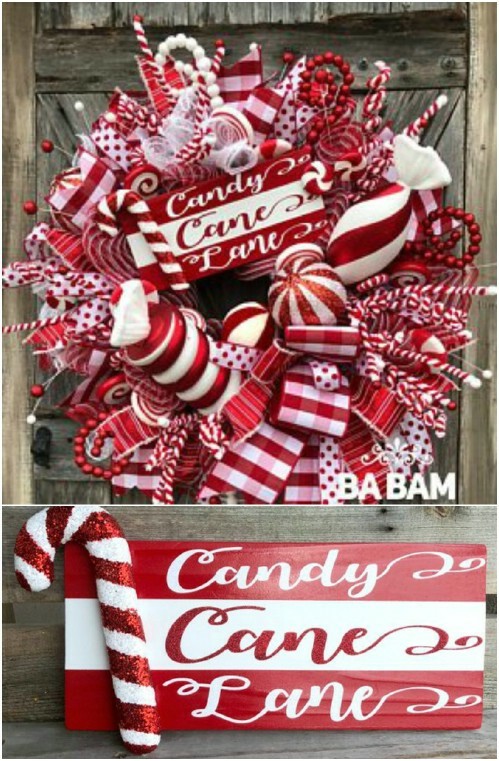 You can cut out the lettering or buy them already cut out and you could even paint them shades of red, white and green to give them a candy cane effect. I love the rustic look of this one. It’s perfect if you are into farmhouse Christmas décor and it’s really easy to make, even if you go all out and cut the lettering out yourself. I found this lovely subway art sign on Etsy for less than $20. If you want however, you could easily recreate this one. 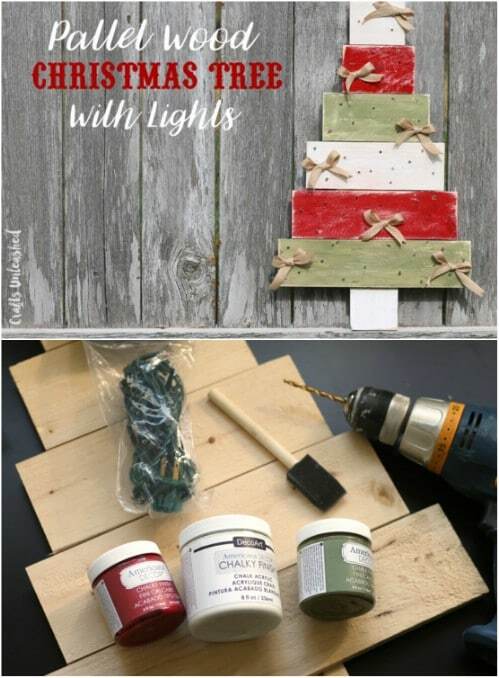 You just need a block of wood or some reclaimed boards and a collection of festive paint colors. 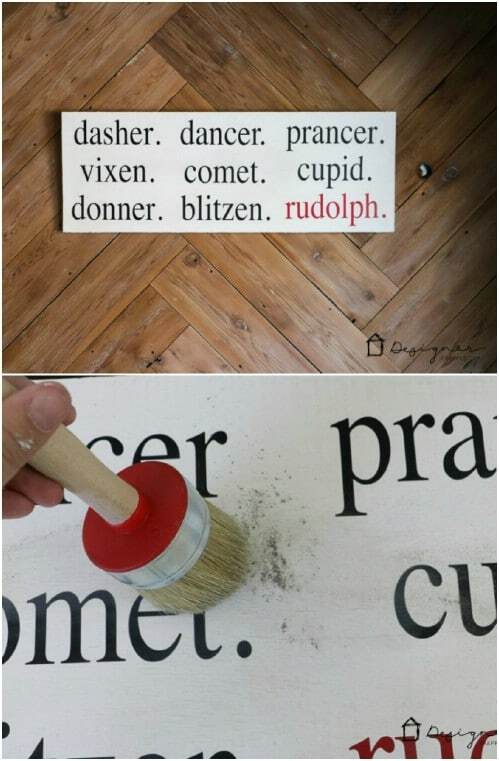 You could use stencils to create the lettering and then just have fun, painting Christmas words and phrases all over the board. It’s really simple and would look lovely in any room this holiday season. This ornament shaped wooden sign would be the perfect entryway plaque or you could hang it on the porch. You just have to cut your wood into an ornament shape or buy one that is already cut and then decorate with fabric or scrapbooking paper and embellishments. The wording on this one can be done with wooden lettering or you can find these decorative sayings at the Dollar Tree. Imagine a time when you bought your Christmas tree fresh off a tree farm. This DIY wooden Christmas sign will help you to reminisce about those times and it is super easy to make. You could be creative and make your own slogan or saying but the gist is there…you end up with a rustic farmhouse styled wooden Christmas sign that is perfect for your old fashioned Christmas. You can find a load of round wooden plaques for crafting. Take one of those and turn it into an adorable oversized ornament wooden sign to hang in the house or on the porch this holiday season. These are super easy and you can customize them however you want. Just pick out what you want the sign to say and then paint it onto the wood round and add a hanger and you’re all done. I would like to see the tutorial on the wooden pallet Christmas tree.